Here’s a BURLY offering from Custodian. Yet the album title has me wondering whether this is entitled the roman numeral “1” or I as in me, myself and I? Quite unclear due to the fact that there is very little information provided here and all the tracks are left untitled, which may hint at the title being the former because the entire album almost runs as one long track, not because of the fades in between – which do occur – but because of the monochrome spectra of I. This is extremely harsh noise with just a touch of atmosphere, mostly coming to light in the last track. The production on I is extremely shiny, crisp and alive, easily clearing out my ears. Very crunchy mid-range with chugging lows and screeching highs. There is a persistence of feedback throughout that stays consistent. There is definitely a lot of thought put to the quality of sounds, and some of the compositional factors but there is still something essential missing here that fails to give me much interest. Perhaps the most engaging track is the last with some weird digital-style artifacts and drones that are raw and show perhaps the first small points of originality here. This is one for the harsh heads and as far as harshness goes, I delivers. Infleunces I can guess at would be Ames Sanglantes, Ichorous, and Bizarre Uproar. What Custodian does here he does with purpose and competence taking queues from the best of the genre but not adding much originality to the mix. 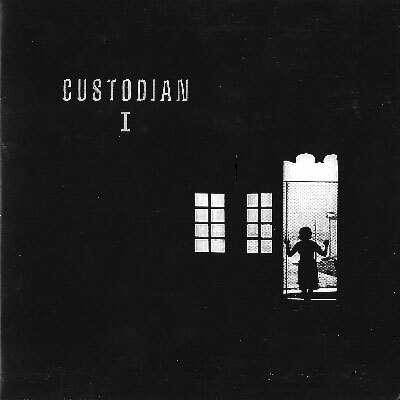 This is the first Custodian release from 2008…the “I” is a roman numeral one.